The TWR-DEV-PERIPH is a developmental peripheral board designed to extend the capabilities of the Freescale Tower KIT. Designed for use with the TWR-S12G128 board, the TWR-DEV-PERIPH board conforms to the Freescale TOWER specification and may be used with any TOWER module. The following is a brief listing of features provided by the TWR-DEV-PERIPH board. 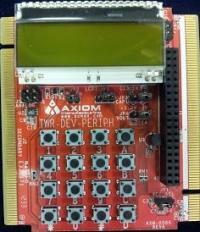 For quantity discounts on orders of 25 or more TWR-DEV-PERIPH boards on a single order, please contact Axiom Manufacturing directly.